See photos and link below. In addition to the clean up and park service projects we will feature the Confluence iNaturalist BioBlitz hike led by expert Rick Ramos. iNaturalist is a citizen science project and online social network application that uses your mobile phone's camera and internet connection (or digital camera and web browser on your laptop or desktop computer) for sharing observations of the rich biodiversity of flora and fauna in our own Auburn State Recreation Area. It literally puts Nature At Your Fingertips. See how to sign up for an iNaturalist Account here. There are three ways to log in: iPhone, Android or computer. The Canyon Keepers will be leading a Historic Bridges Hike. Award-winning artist Juan Peña will demonstrate his 3 color watercolor technique in the Confluence Area. 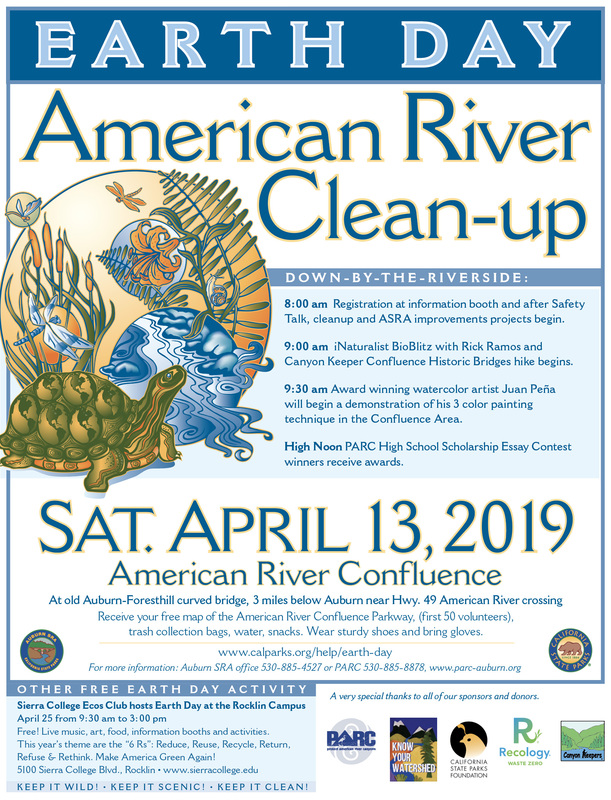 Receive your free map of the American River Confluence Parkway (first 50 volunteers), trash collection bags, water, snacks. Wear sturdy shoes and bring gloves. Auburn SRA Earth Day Cleanup and Park Improvement Activities co-sponsored by the California State Parks Foundation. Invite family and friends to "responsibly care for and enjoy the American River and it's canyons. Juan Peña will demonstrate his 3 color watercolor technique in the Confluence Area starting at 9:30 am. With your support and the support of other like minded individuals, PARC has accomplished much over this past year. For the first time ever, PARC has an office (in the Gomez Art Center 808 Lincoln Way, Auburn, CA) and a part-time paid employee. Donate to PARC on May 2. Early donations will open on Monday, April 15! Click on the graphic above to view PARC's statement on the Big Day of Giving website. Early Donations will open on Monday, April 15! View PARC's statement on the Big Day of Giving website. Early Donations will open on Monday, April 15! Join PARC at the home of our new office space for a River Canyon Art Show Fundraiser. 16 artists, live music, beer, wine, and hors d'oeuvres. This is the opening night for the season's first Auburn Art Walk. The art show will come down on May 24th. Fluffy clouds floated overhead as the Free Auburn River Festival at Auburn's Whitewater Park on the North Fork of the American River got underway on Saturday June 9th. The Festival featured three events including a downriver race, Olympic style slalom races and whitewater kayak rodeo competition that drew competitors from all over our region. Hundreds of spectators lounged on the riverside to view the competition. Music, food, community information booths and kids activities were available in a river village setting. The Whitewater Park is a special feature of Placer County Water Agency's Pump Station that allows fish to migrate upstream to spawn. The park has Olympic-style rapids for recreational boaters to play and compete within the Auburn State Recreation Area boundaries. The event was organized by Auburn River Festival and co-sponsored by many including PARC, PCWA the City of Auburn and Sierra Outdoor Center. Many thanks to all who made this Free River Festival a tantalizing first success. For more information about the event visit auburnriverfestival.com. See photos and videos below!